RALEIGH, N.C. —The Health Physics Society has named Jason Davis, an ORAU health physicist, as the 2017 recipient of the Elda E. Anderson Award, an annual honor bestowed to one of its young members for excellence in research or development; discovery or invention; or significant contributions to the health physics profession. The award was presented to Davis during the 62nd annual meeting of the Health Physics Society, July 9-13 in Raleigh. 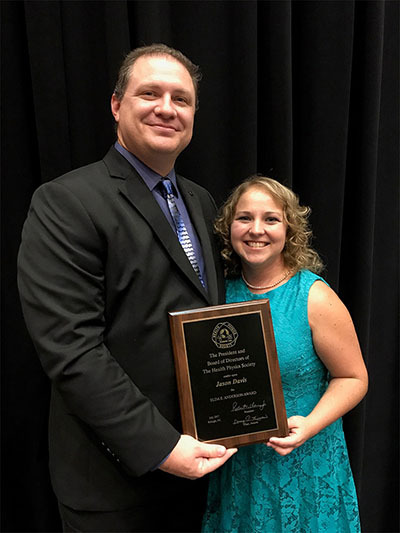 ORAU Health Physicist Jason Davis and his wife, Samantha, display the 2017 Elda E. Anderson Award he received at the Health Physics Society Annual Meeting. Davis joined ORAU in 2009 to work on projects associated with the National Institute for Occupational Safety and Health (NIOSH). As a member of the NIOSH Special Exposure Cohort team, Davis researches the historic monitoring practices of sites to determine whether sufficient information exists to adequately bound radiation exposures to employees. He communicates this information, along with analyses of the methods to bound radiation doses using the data available, through evaluation reports, project reports and white papers. At ORAU, Davis works closely with Eric W. Abelquist, executive vice president and chief research officer. Abelquist is a former recipient of the Elda E. Anderson Award and is the new president of the Health Physics Society national organization. Davis recently assisted Abelquist in the execution of the Radiation Protection Research Needs Workshop held earlier this year and has helped organize a Visiting Faculty Research Program pilot that will be completed in August. As an active member of the national Health Physics Society since 2005, Davis has held key leadership roles in the professional organization. He has served on the HPS Continuing Education Committee (2012-2015), is serving a 4-year term on the HPS Program Committee, and has recently been nominated as a member of the HPS Nanotechnology Committee. This year, he is the HPS Program Committee’s Annual Meeting Task Force Chair, and he serves as secretary of the East Tennessee chapter of HPS. Davis holds a doctorate in applied physics from Idaho State University, as well as bachelor’s and master’s degree in health physics from the University of Las Vegas. He is certified in the comprehensive practice of health physics by the American Board of Health Physics.